The eagle has landed at Evergreen Elementary School. 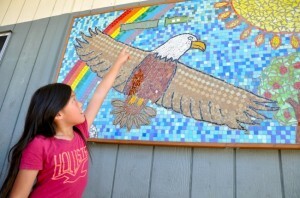 A beautiful tile mosaic of a soaring eagle, the school’s mascot, was unveiled during an assembly in May. For 20 weeks, eight Special Education students worked with artist Robin Bott. “All the students really loved creating the mosaic and were really excited to unveil it. The collaboration and teamwork they displayed was amazing,” said teacher Ashley Marshman. The creative project was made possible through the Accessible Arts grant through the office of L.A. County Supervisor Don Knabe. Several months ago, a school-wide contest was held to create the mural design. Third grade student Elim Jiang was named the winner. She received a certificate of recognition during the assembly. The 4-foot-by 3-foot mural depicts an eagle soaring above the clouds and through a rainbow. A golden sun shines over an apple tree. Jiang said her favorite part was the plane with an Evergreen banner flying above the eagle. Bott leads hands-on art projects with students throughout the county. “First, the class started with paper mosaics and drew some eagles,” she said. Then the class selected one of the drawings submitted for the contest. “And it was so hard to choose because they were all so beautiful!” she said. Bott then transferred the winning design onto the panel. Her artist father built the frame. And Bott cut hundreds of the colorful tiles. “And then we started tiling!” she said. First, students outlined the design with small tiles; then they used larger tiles to fill it in using a water-based glue. Student representatives from several classes also glued pieces of the tile mosaic. “It has been such a joy to see the mosaic slowly coming to life as students worked diligently and cooperatively on it. Now it serves as a wonderful vision to everyone that our Evergreen Eagles SOAR! Evergreen was one of only 13 schools in the state to be named a California Exemplary Arts Distinguished School, and this mosaic project is one of many examples of the beautiful and creative activities that our dedicated staff provide for all our students,” Principal Carolyn Wills said. This entry was posted in University of La Verne and tagged evergreen elementary, walnut, Walnut Valley Unified by Richard Irwin. Bookmark the permalink.